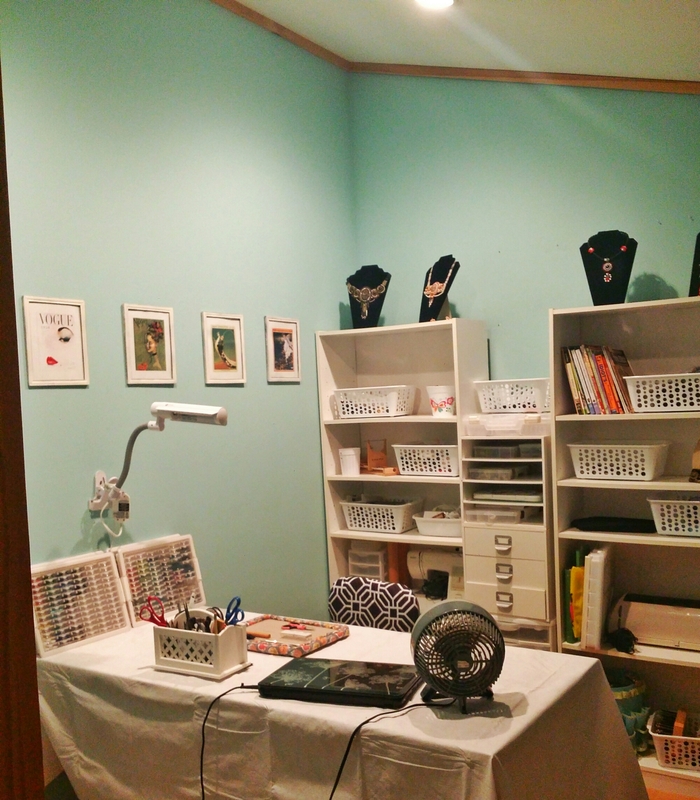 Over the years I have worked with ceramic cabochons and pendants that my husband graciously help me glaze and fire. About 5 years ago I started working some with polymer clay. Somehow it never felt quite right to me. It just always looked and felt plasticky. Even the more organic looking pieces I made still looked like plastic up close. Recently, through the wonderful educator, Youtube, I saw some videos on using translucent clay and liquid clay to create layers in the clay. This creates stone-like dimension. 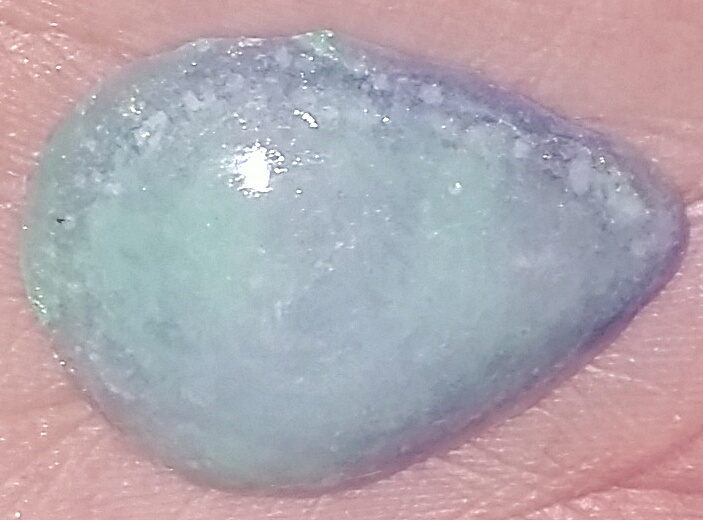 They create faux opals, fluorite and all kinds of semi transparent stones with inclusions. When I can, I prefer to use real stones, but sometimes with my budget or my desire to use an obscure color, that isn’t possible. So…I started playing around with liquid polymer clay. I already had a pretty good background in other faux stone techniques thanks to Cindy Lietz’s Polymer Clay Tutor’s weekly posts (beadvideo.com – it’s a subscription service but so worth it, at least for basics). 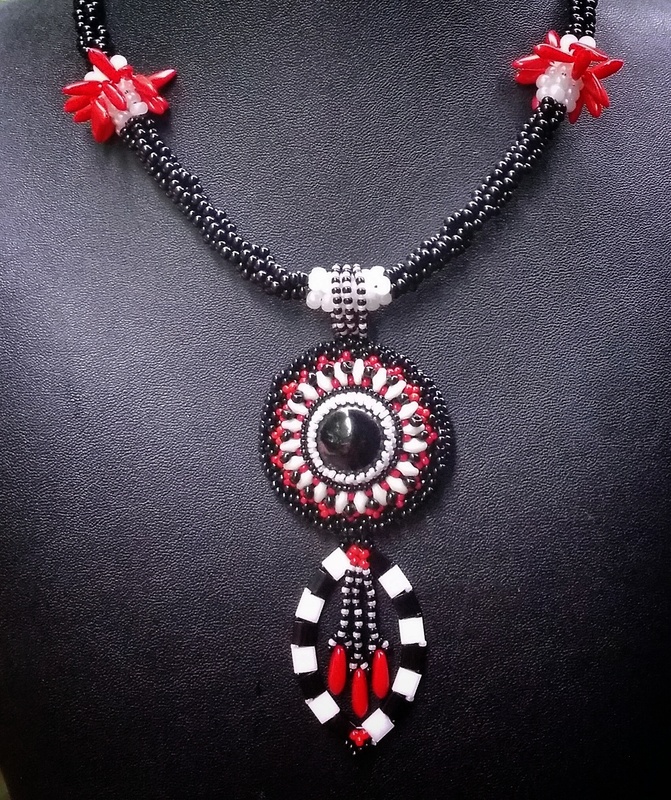 The Sept Challenge was to create a bead woven work using black, white and only one other color. 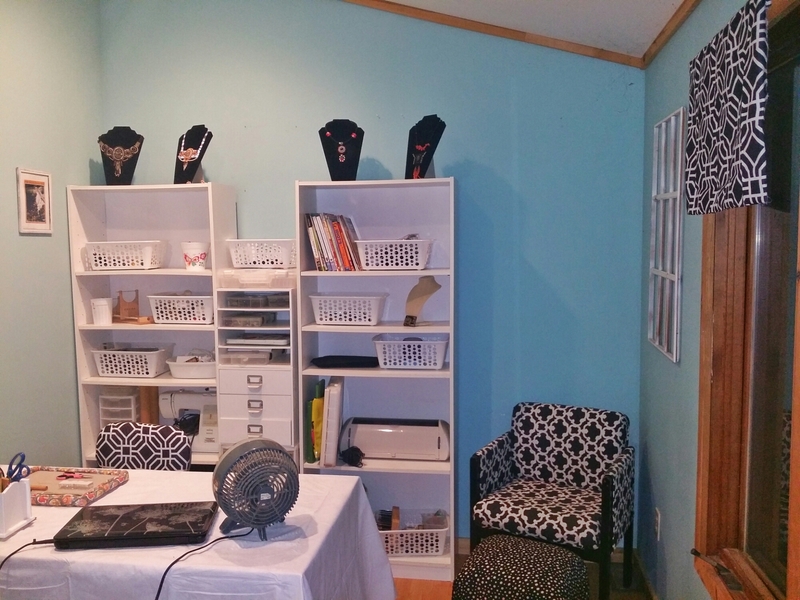 This was definitely a challenge for me because I tend to gravitate toward earthy, neutral palettes. 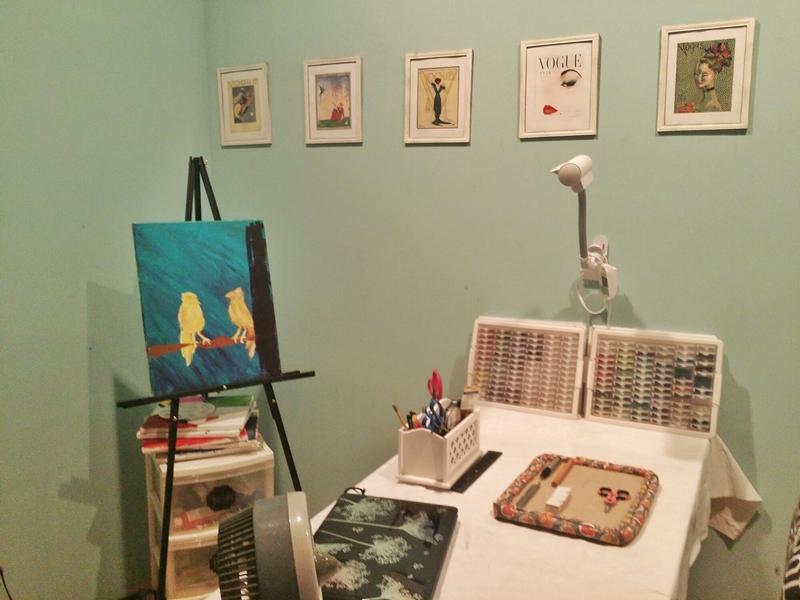 Initially I played with yellow and turquoise as the accent color but I kept coming back to red. As I worked in the stark black and white, I was reminded of Aunt Em and Uncle Henry’s black and white Kansas farm. The red seemed to be the pop of color from Oz. Maybe some poppies for Aunt Em? But not really poppy shaped. Then, as I worked on the tila bead checkerboard patterned diamond, I started to think of Harlequin patterns in the Queen of Heart’s dress in Alice in Wonderland. The white and red beads reminded me of the starkness of the white roses with drops of red paint spilling off them. As far as technical process, the focal is a round onyx surrounded by Superduos and seed beads and backed with ultrasuede. 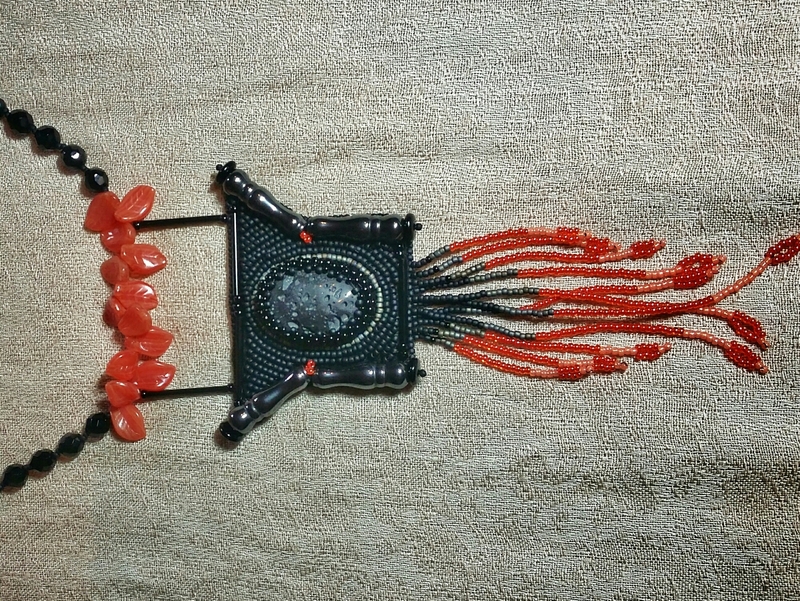 The diamond is made of tila beads, seed beads and daggers. The rope is 18″ long and is stitched in 3 drop, zipped peyote. 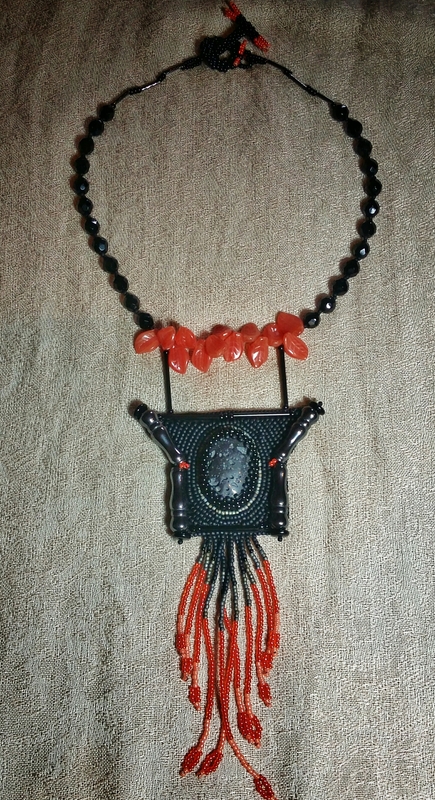 The toggle clasp is hand beaded and accented with tila and dagger beads. 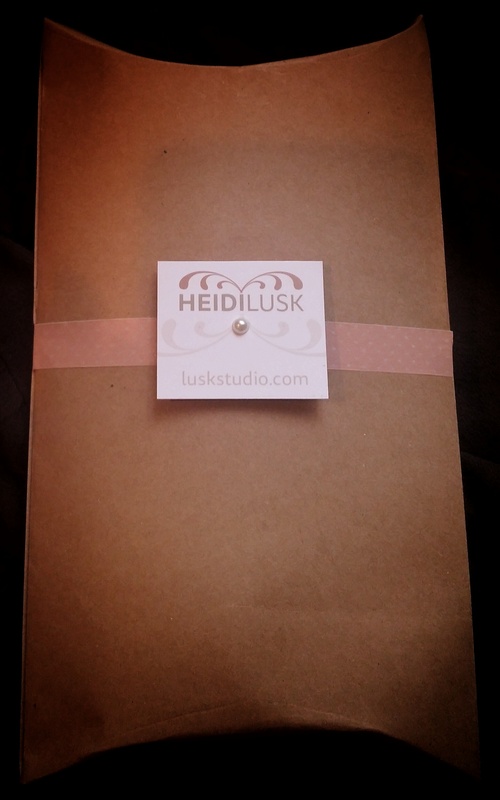 Since my day job is in advertising, the branding and packaging of my jewelry has been a fun project. I finally got to work on my own brand but I discovered that I am a horrible client. It’s so much harder to brand myself than it is other clients. I knew I wanted something elegant and neutral, something rustic yet modern. These are the broad strokes that made me spend hours sketching and sampling colors. I had to take a step back and deconstruct everything. But finally I arrived at the new logo and I’m very happy with it. After the logo, I knew I wanted a multifunctional business card. 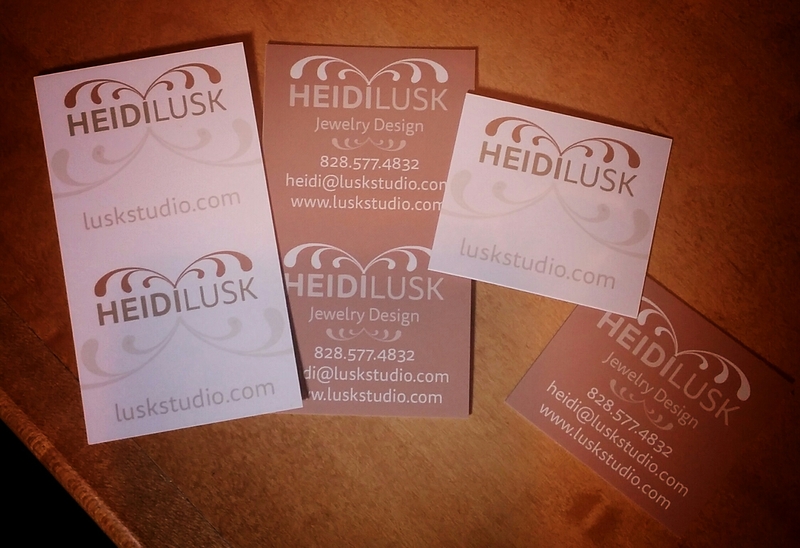 I designed a card that I have printed at an online printer (PS Print) and then cut apart myself to create two earring cards/business cards. On the front, it’s more decorative and I incorporated two barely perceptable dots that I can punch through if I’m using as earring cards. On the back I have more contact info. For packaging, I wanted something I could make myself and that I could adjust to the size of the piece. I found a pillow box making tool, which is cool for smaller pieces but not large enough for the collars. I kind of adapted that design and made it larger, using a template and scoring tool. I used kraft card stock. I found some terracotta colored washi tape to act as a ribbon and tacked a business card with a little sticky pearl accent. Of course I pack in plastic and padded envelope or box, but this is the pretty part. I think it’s important to go that extra mile for customers–all a part of the experience. This is my first beaded buckle and I will say the photo doesn’t do it justice (trying to get better at photographing my work). 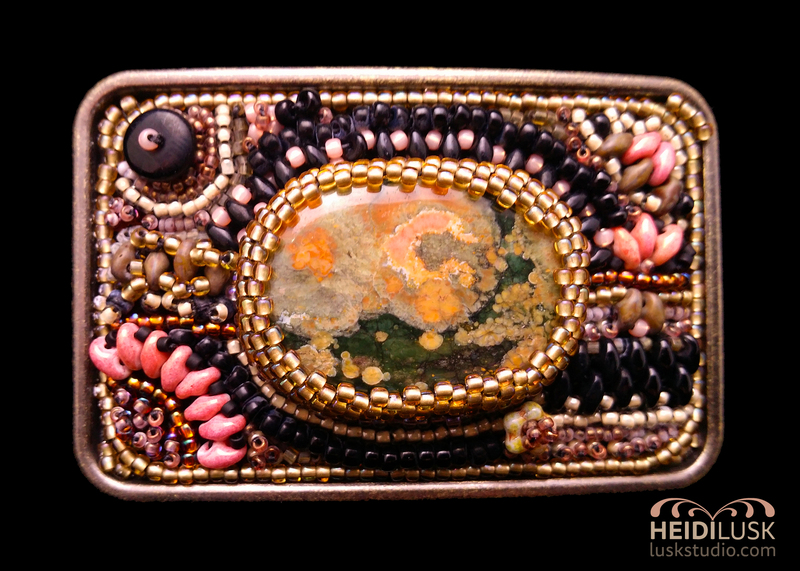 The salmon, coral and olive colors are so pretty and work well with the antique bronze color of the buckle. I actually was able to do this quickly since it’s pretty small (3×2) and requires no beaded backing or chain, etc. so the part of me that is driven by instant gratification was very happy. I like this size belt buckle – I ordered it from Buckle Rage and it’s the perfect size for a woman. I wanted to do something that was natural, Bohemian (boho) and floral but abstract at the same time. I so wish the photo conveyed the colors and textures better. They look much more pink in the photo and in actuality the colors are more coral and salmon. I will definitely be making more buckles – I have a larger silver one that I am thinking will go well with either blue or lavender stones that I have. Lately I have been very inspired by the beautiful blooms and wildflowers that we discover during our hikes. In particular, I loved the mountain laurel, dogwoods and lilies that we saw on our hike at Mt Pisgah. I found this cabochon at Ernie’s Rock Shop in Brevard and fell in love with the colors. My photography isn’t great but in person you can see the coral, salmon and delicate mint color in the Leopardskin Jasper stone. It took me a while and many visits to my favorite bead store (A Better Bead & Craft) to find all of the correct hues to match including some perfect glass pearls and salmon colored superduos. Again, my photography is awful but the stones in the background are a color called “honeydew” and they match up very well to the light green color in the stone. 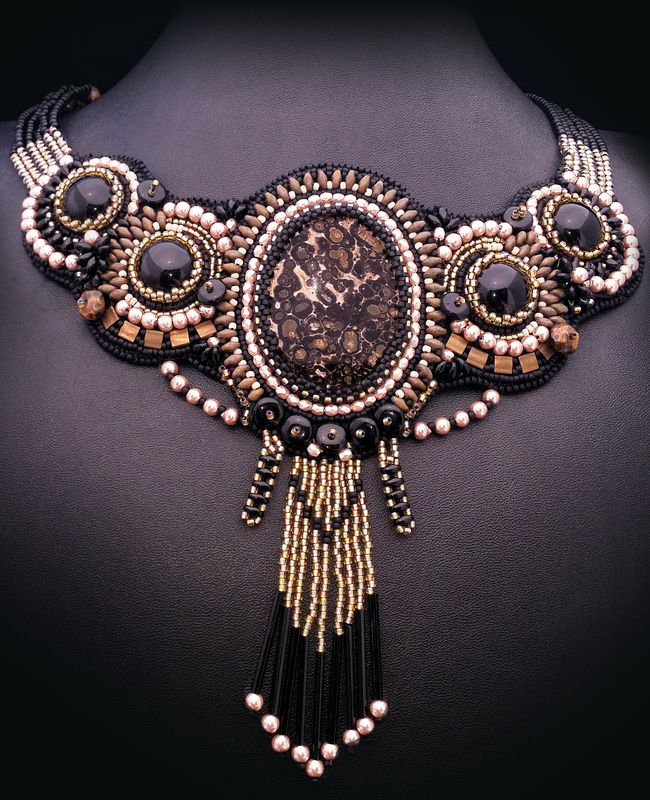 As always, the necklace is backed with ultrasuede and has a beaded toggle clasp. When I was beading this, I knew I wanted the actual chain to be very lacy but simple enough. The earrings I really kind of made as just a freebie to go along with the necklace. I just felt like some dangles were needed! I think it would also look fine with simple pearls. 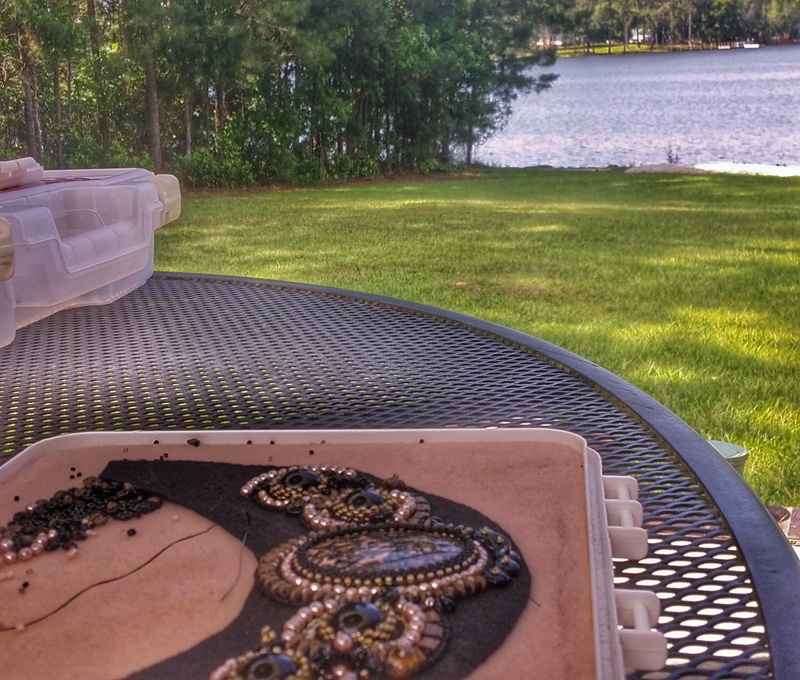 This leopardskin jasper and onyx necklace was inspired by the exquisite sunsets on Lake Murray in Prosperity, SC. Our family spent a week in this unique town. It’s not a rich town, but you soon realize that prosperity isn’t always monetary. It really was a special place where we found an abundance of rest and family time. I guess, you could say my soul prospered. The colors from the lake, the land and the sunset all play a part in this necklace. The leopardskin jasper cabochon is joined by 4 onyx stones, glass pearls, tilas and seed beads to create natural, edgy, sophisticated necklace. 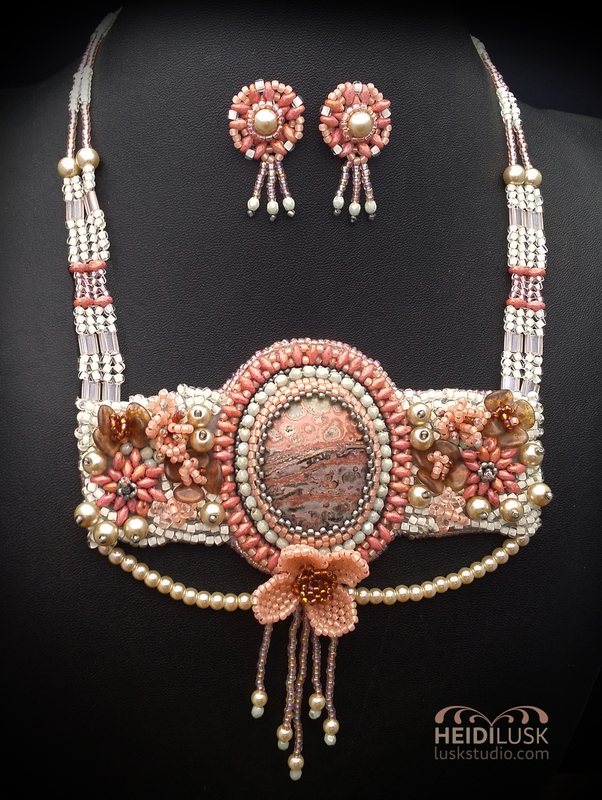 The toggle is hand beaded and the necklace measures 19 inches long.